Why does the IEA keep getting renewables wrong? - Unearthed Why does the IEA keep getting renewables wrong? On the surface, the release of the IEA World Energy Outlook today brought shockingly bad news: the growth of renewable energy capacity added each year is likely to hit a brick wall, as of now, after more than a decade of explosive growth. There goes our best hope of decarbonizing the power sector and driving down global emissions. Not really though. It’s just the IEA, arguably the world’s most prominent energy analyst, doing what they do every year: putting out a tremendously pessimistic take on the future prospects of renewable energy. Most renewable energy analysts are so used to the IEA’s outlandish projections that there is no indignation, let alone shock. However, outside of the renewable world, the agency’s scenarios are often taken at face value. This is what the IEA outlook looks like: a drop-off in added coal capacity, a huge surge in gas capacity, and a stagnation or slow withering of added renewable capacity. 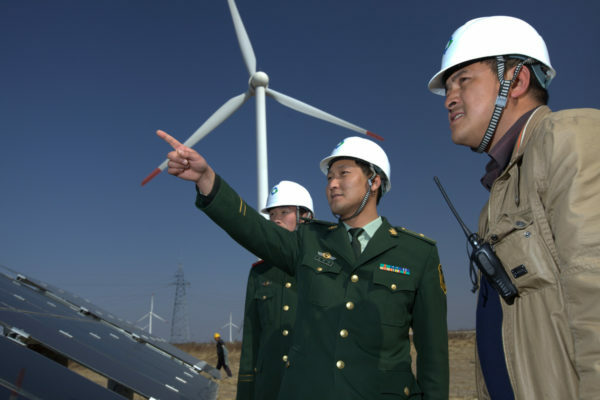 The IEA remains in denial about the renewable energy revolution that is sweeping the world. The agency continues to project zero growth in the market size of key renewable energy technologies for the next years and decades. This is a prediction it has made with stubborn consistency in every single one of at least the past 15 annual outlooks, being proven massively, breathtakingly wrong every time. For example, in the World Energy Outlooks published in 2002-2010, the annual solar power additions in the year 2015 were projected at 1-5 gigawatts, while the actual market size that year was 50 gigawatts – an astounding 10 times as high as the IEA projected just 5 years prior. 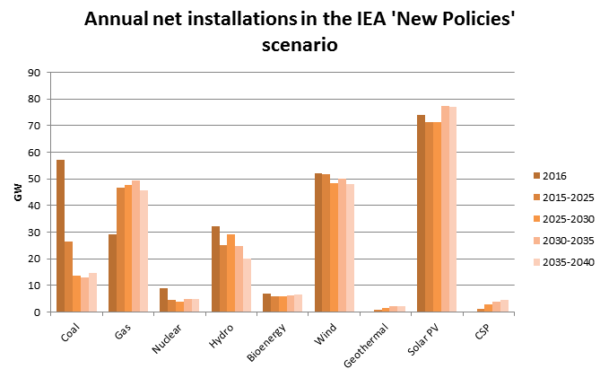 The IEA argues that the New Policies Scenarios are not predictions or forecasts, simply assessments of ‘where today’s policy ambitions are likely to take the energy sector’. However, global policy ambition on solar did not increase ten-fold from 2005 to 2010, the ability of the technology to deliver did. Providing information on how much solar capacity current and expected policies are likely to deliver is exactly the job of these scenarios and, so far, they have been worse than useless in that job. Forecasting the future is very hard, while picking faults in the work of an agency that puts out detailed scenarios every year is easy. However, the blatant underestimation of renewables goes well beyond normal shifts, surprises and misjudgments that are to be expected in any attempt to assess the future. If you keep making the exact same assessment for 15 years and are wildly wrong every time, you go back and assess the premises for your assessments. If something is happening in the real world that your models fail to capture, you improve your models. Anything else is not a good-faith effort to look at energy sector trends. The IEA is clearly either too politically constrained or ideologically biased to provide an objective assessment of the renewable energy sector – even if the failure to do so gets more and more embarrassing for the agency. Ten years ago, new renewable sources were small enough that even a ten-fold error would not throw the assessments off too much, but with the explosive growth of the sector, that’s not the case anymore. Incorporating real-world trends in renewable energy into the scenarios would show that the shift to renewables needed to address climate change and air pollution is much more attainable and affordable than IEA projections make it seem. That might help governments agree on more ambitious targets or policies. Luckily, the financiers of the renewable energy sector seem to realize that the IEA is wildly off in its assessments – if they did believe the IEA, they would be selling off shares and yelling at companies to hold back expansion. The sector is scaling up capacity and banking on growth, so if growth was going to hit a brick wall like the IEA predicts, that would mean falling utilization and hard times for the manufacturers. However, the pessimistic renewable energy projections do continue to give false security to investors in fossil fuels, by signalling that clean energy will remain too small to send fossil fuel demand into a decline. Much of the reporting on this year’s outlook focuses on the impact of electric vehicles on global oil demand, which the IEA says will be limited. Getting renewables wrong doesn’t mean that the IEA will get EVs wrong too, of course, but the agency’s track record in incorporating disruptive change into its scenarios means a closer look might well be warranted.